Vintage Santa Xmas postcard gallery. Photo Mosaics, Digital Photo and ASCII-Art. This is a part of the postcard collection that I use make mosaics. More than 700 of my favorite Old Russian Soviet New Year greeting cards. Here you can see postcards of soviet era (1950 - 1990). You can find here pictures of soviet Santa - Ded Moroz. His daughter (or may be girlfriend) Snegurochka - snow girl. Soviet Xmas tree - Yolochka - with Russian Red Star on top. Snowman - Snegovik - made by soviet children - Oktyabryata. and many other funny creatures big and small. And also 200+ vintage European Christmas greeting cards in gallery below. Russian Santa - Ded Moroz postcards. Funny creatures: Rabbits, Squirrells, Birds. The most famous Russian Animal: Bear. Clock - the Symbol of the New Year. Decorated Moscow Cremlin and St.Petersburg streets. Christmas decorations, Soviet Xmas tree - Yolochka. Aerospace related collection of Xmas and New Year postcards. 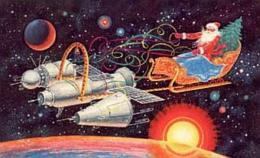 See as Santa Ded Moroz rides a space rocket Sputnik while small boys in the space suites send a New Year greetings to all people of the Earth. drink, sing and make fireworks. Small part of cards that was sent me by users of my programs from all around the world. This collection is not big so far but you could help make it bigger ;-) When it would be enough to make Mazaika picture library from it I'll make it and upload along with other librarys. Also you can sign my guestbook and view comments of other visitors.